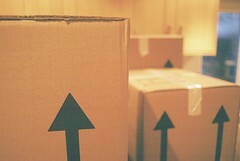 I've been undergoing a protracted office and home move for a couple of months now. The good news is that we are now moved into our new home and office! The bad news is that it will still take two or three weeks until we get fully functioning broadband, and thus the ability to release a new version of bliss. The broadband delay is due to us switching the landline provider. Apparently, a two week cooling-off period, mandated by Ofcom (the telephone regulator in the UK), is required when changing provider. Until that period is over, and the landline is newly registered as being run by the new operators (Primus, in case you were wondering), we cannot order broadband. This two week cooling off period is, I think, designed to allow people who have been the victims of slamming to reverse a switch. The trouble is that it causes a delay when you move into a house with an active phone line which you don't intend to use and which you want to switch from the expensive incumbent telephone provider, BT. In the meantime, I've been able to implement plenty of bug fixes and improvements to bliss. With my new office set up (aside from the Internet connection) I am able to test these fully, so there shouldn't be much delay in releasing a new version once we are connected! Thanks to Nathan O'Nions for the image above.